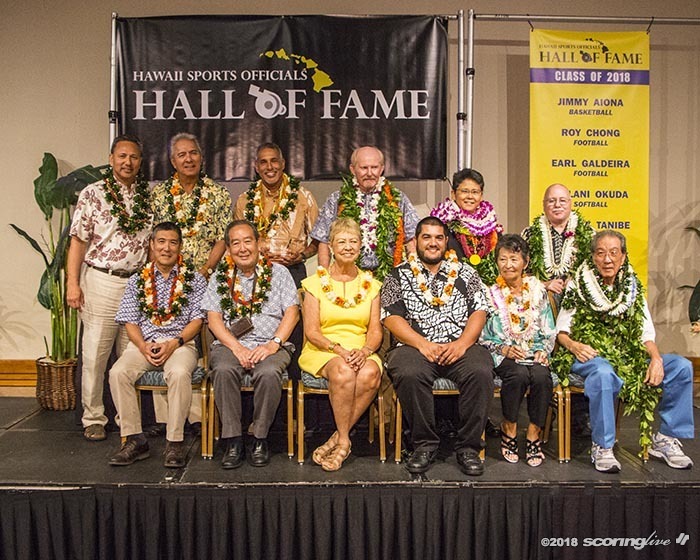 The Hawaii Sports Officials Hall of Fame inducted its inaugural class at a recognition banquet Sunday night at the Ala Moana Hotel. 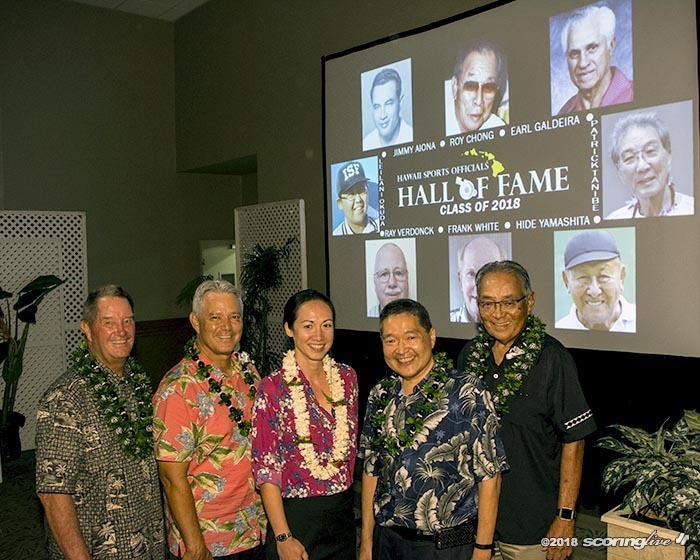 The eight inductees were selected based on the criteria of demonstrating the highest level of achievement, character, leadership, skill and commitment to officiating over a significant period of time. 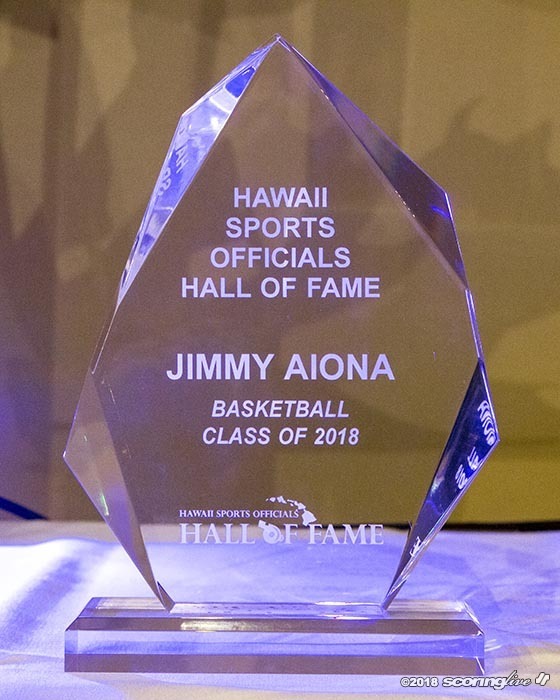 Jimmy Aiona (basketball): Innovator and pioneer among basketball officials in Hawaii. 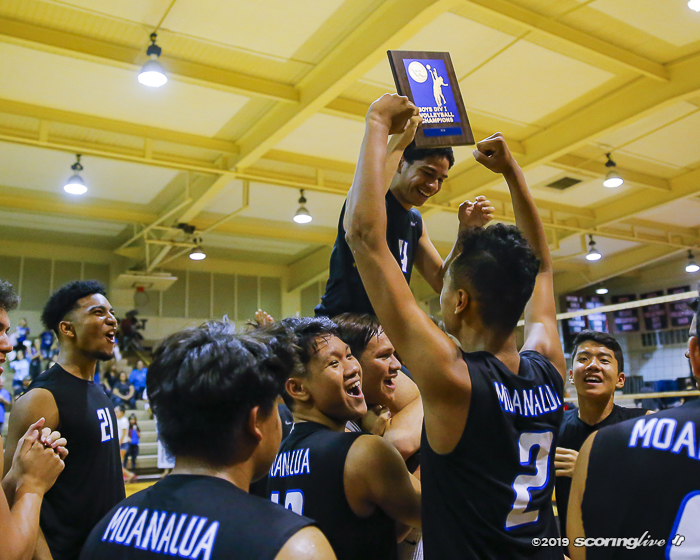 Officiated high school, college, semi-pro and military teams in the 1950s and 60s. 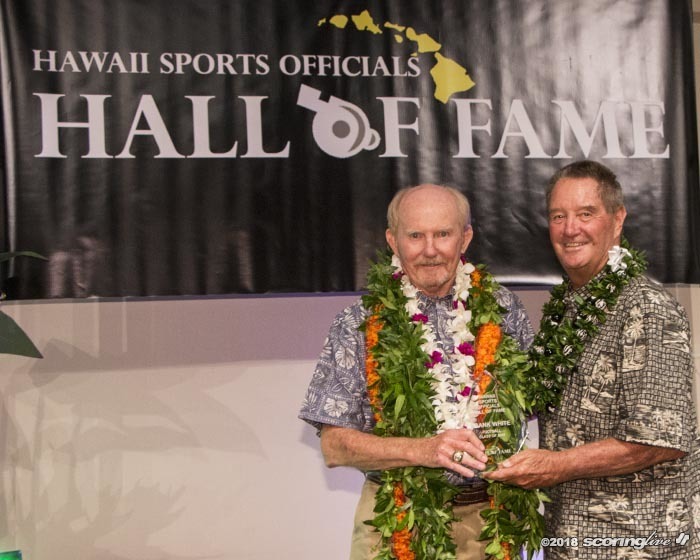 Began training officials in the 1960s and served as both high school and University of Hawaii assignor. Created many of the rules in use today including alternating possession and the advantage/disadvantage philosophy. 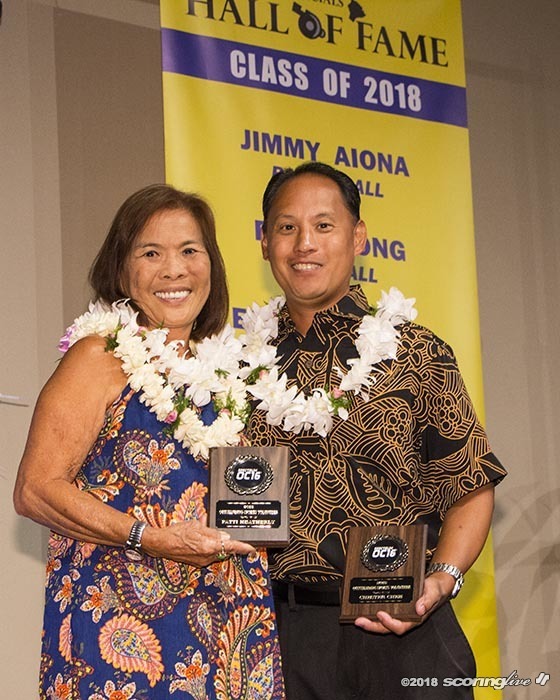 Accepting the award was Jimmy's son James "Duke" Aiona Jr.
Roy Chong (football): Served as the first OIA football commissioner appointed in 1967 until his death in 1999. 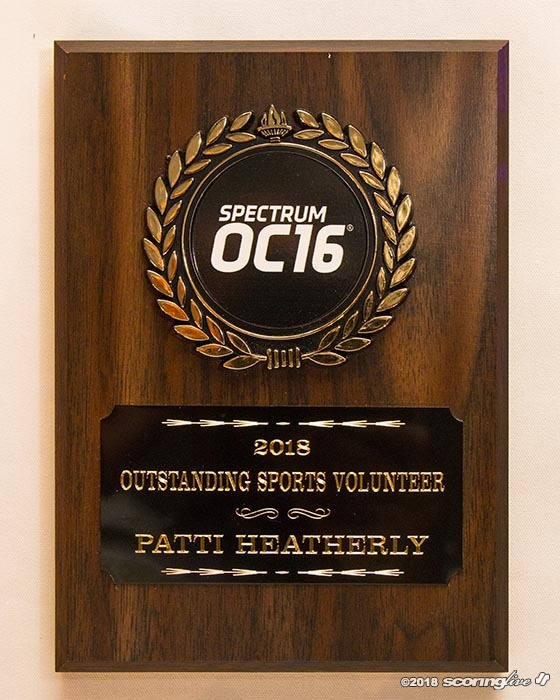 Provided training to all new and veteran officials and assigned games including the Prep Bowl in 1973. 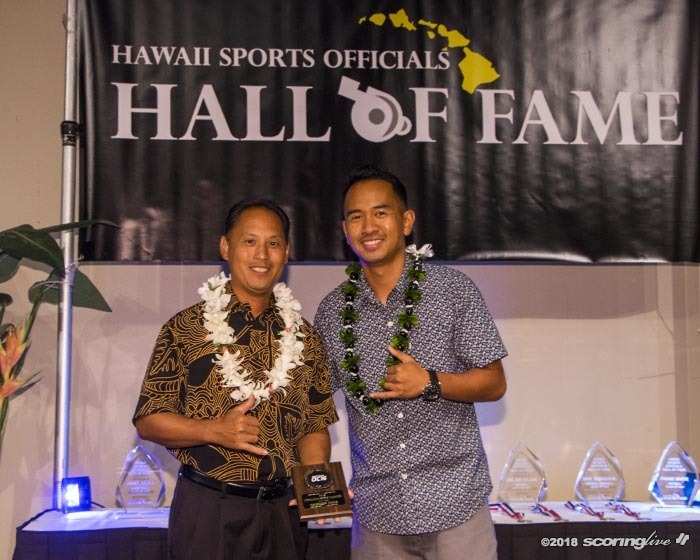 Well respected by coaches and officials, Chong mentored many of today's top college officials. 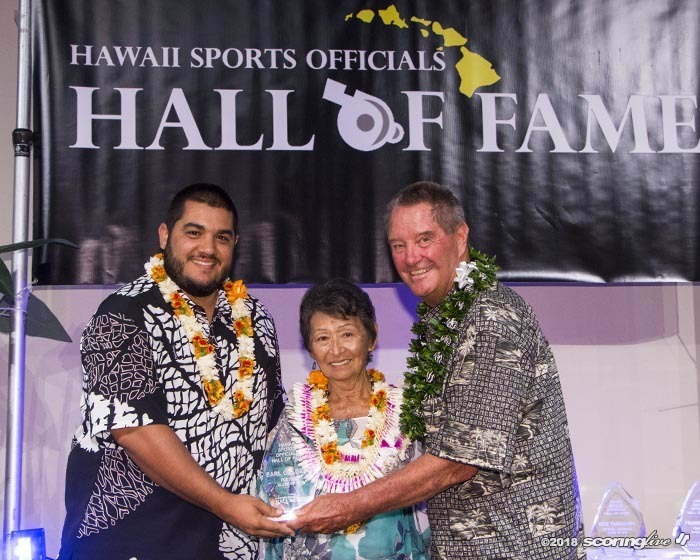 Accepting the award was Roy's son Elroy. 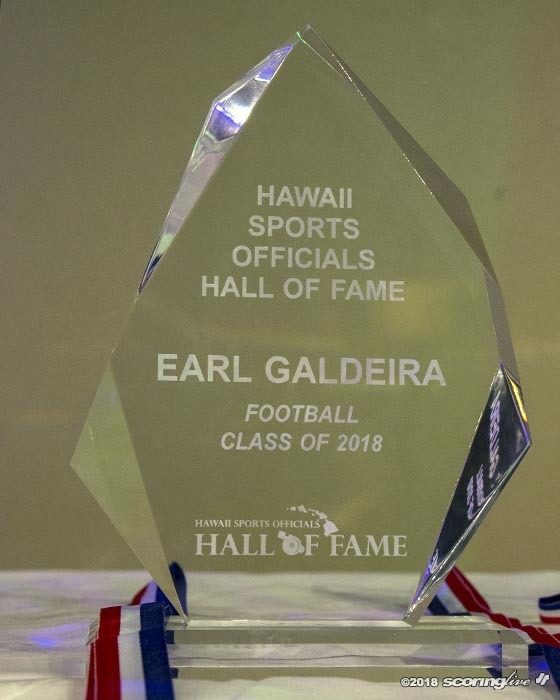 Earl Galdeira (football): The dean of Hawaii football officials. 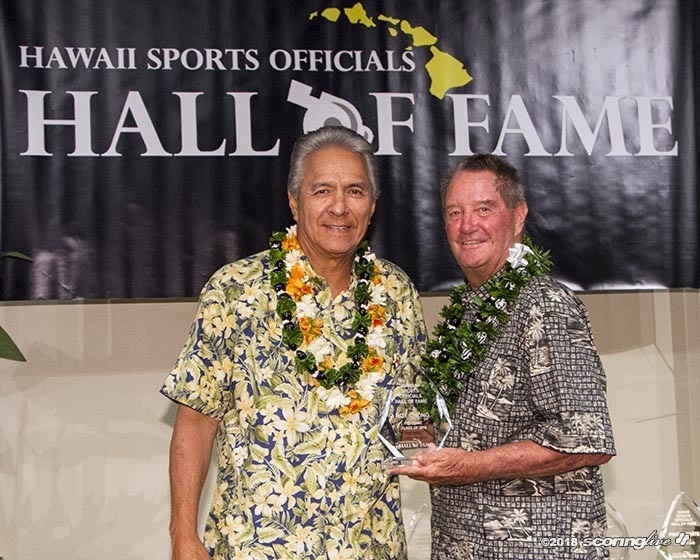 Worked 25 consecutive Hula Bowls as part of the officiating crew. 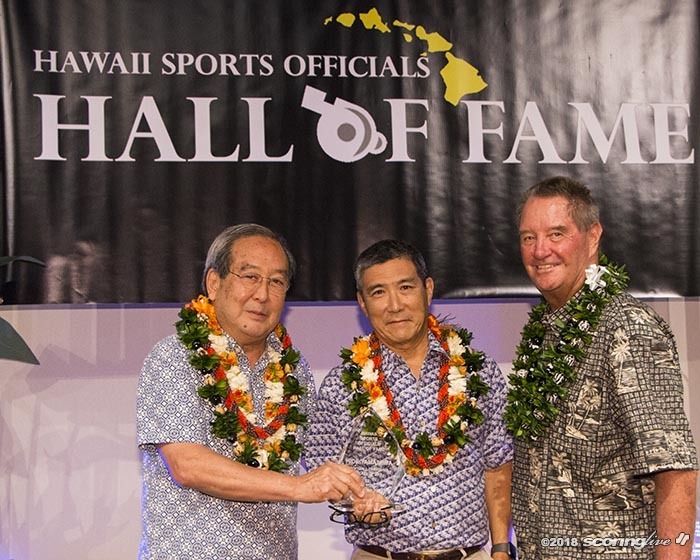 Became the first Hawaii official to work a mainland postseason game (East-West Shrine Game), as well as the Japan Bowl. 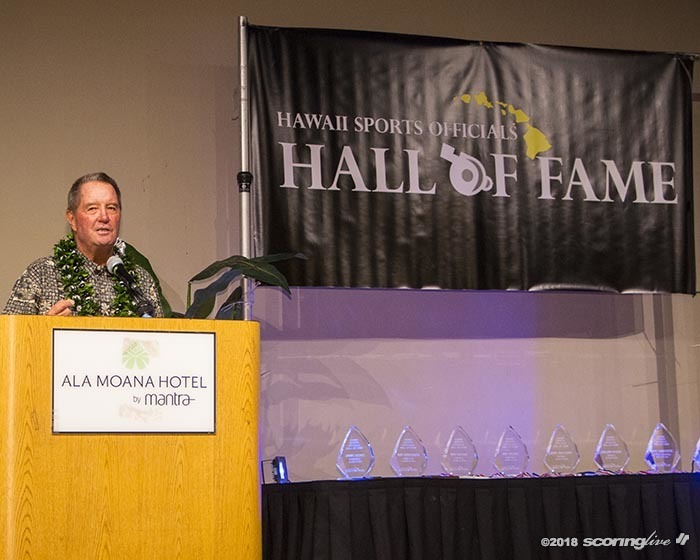 He was named to the National Football Foundation College Hall of Fame in 1996. 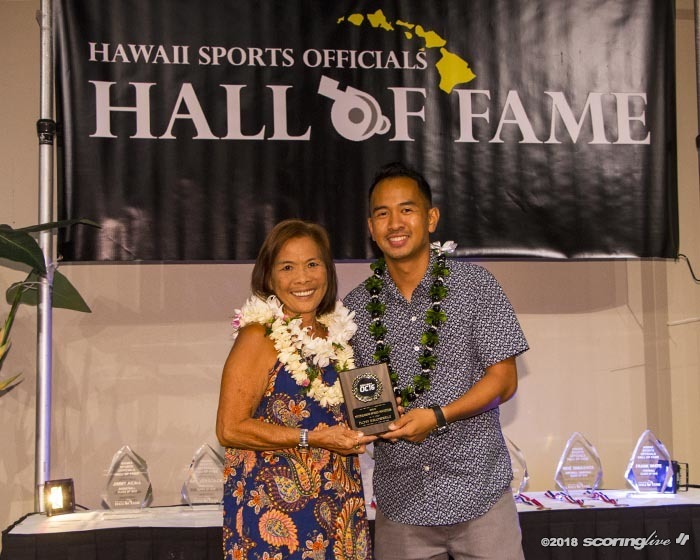 Accepting the award were Earl's wife Frances and grandson Kyle. 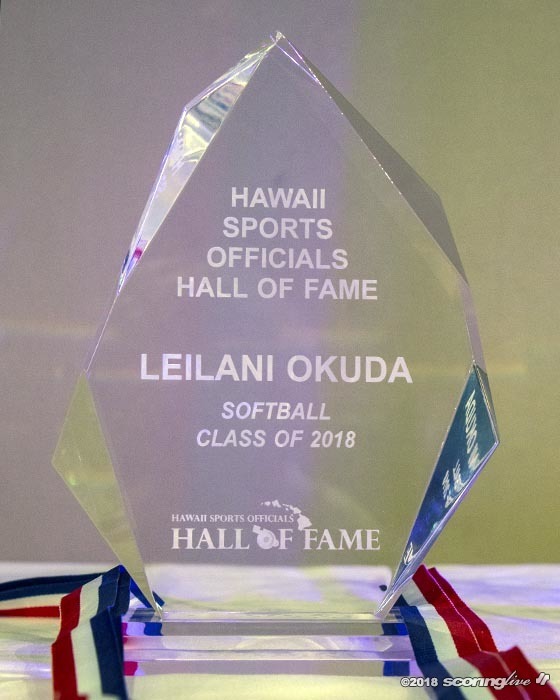 Leilani Okuda (softball): An umpire since the age of 15, Leilani was the first from Hawaii to be a certified international softball fast pitch umpire in 1996 and culminated her career as an umpire in the 2004 Olympic Games in Athens, Greece. 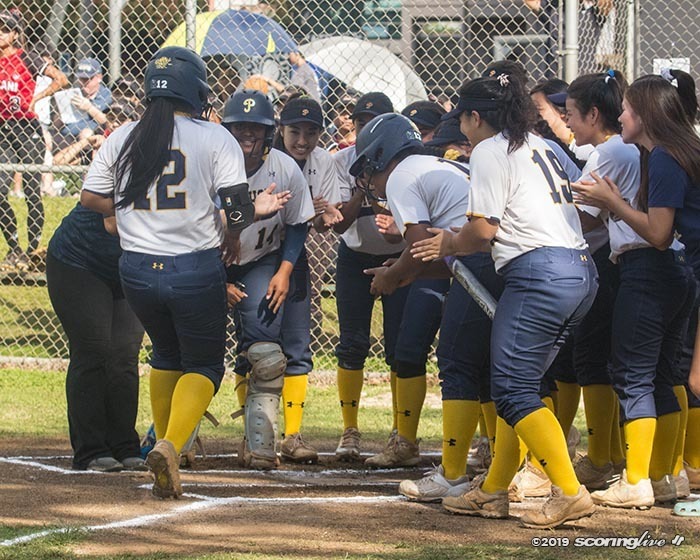 Coaches agree she is the best softball official in Hawaii and through her 25-year career, she served as a mentor and counselor of many future umpires. 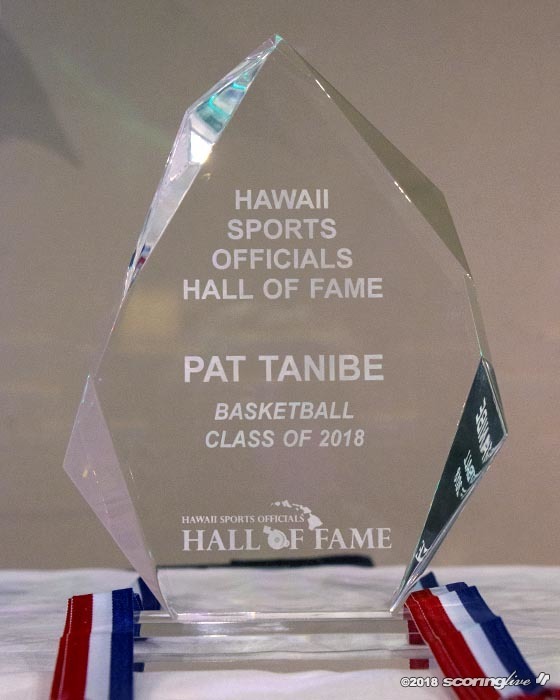 Patrick Tanibe (basketball): The most famous and decorated basketball official in the modern era. 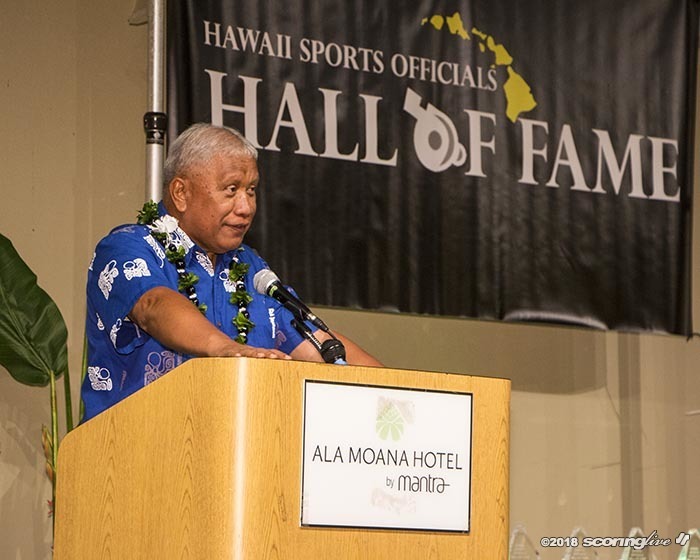 Was one of the first Hawaii officials to be selected to work in a Division I conference (Western Athletic) and received prestigious assignments including the Maui Invitational, Rainbow Classic and Chaminade's upset of Virginia in 1982. 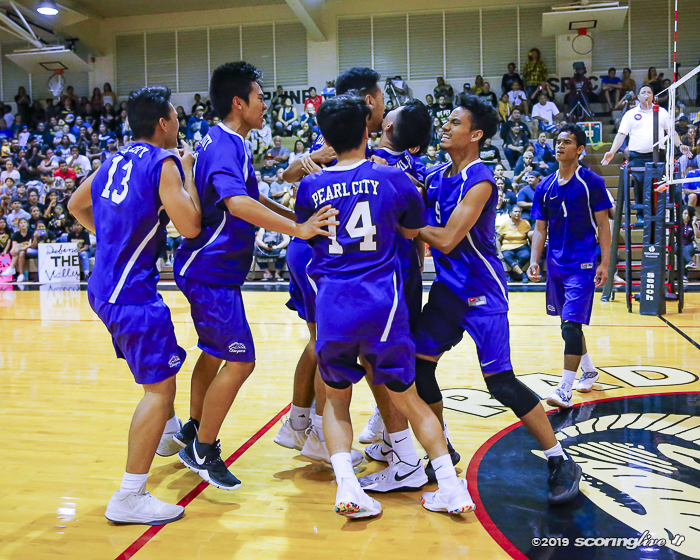 He officiated the NAIA national championship tournament for three years and founded the Hawaii NCAA summer basketball league to develop and train young officials. 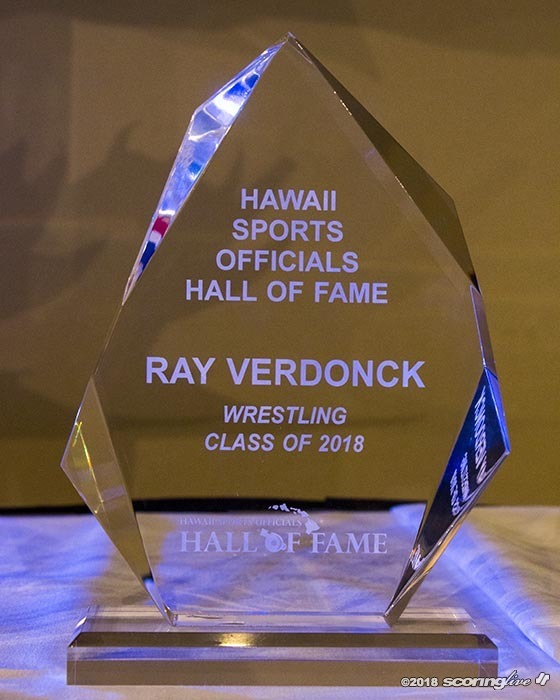 Ray Verdonck (wrestling): Considered among the officiating leaders in high school wrestling. 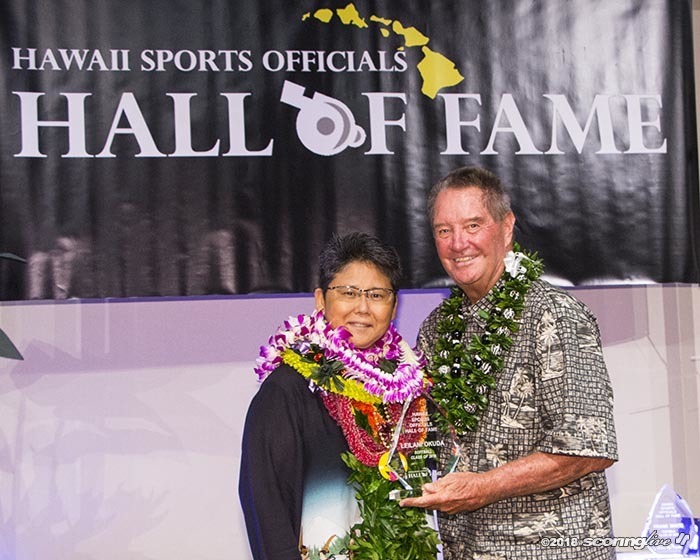 During his 36-year career in wrestling, Ray has served in nearly every capacity in officiating, administration and mentoring. 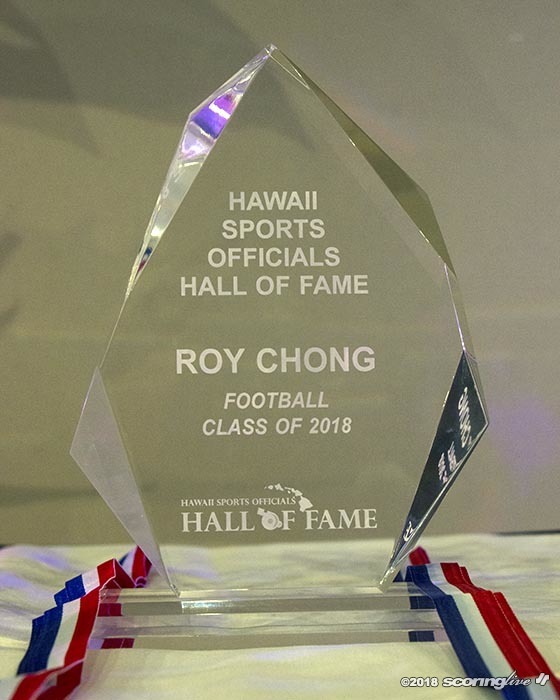 Honored by both the Oahu Interscholastic Association and the National Federation of State High School Associations for his role in officiating. 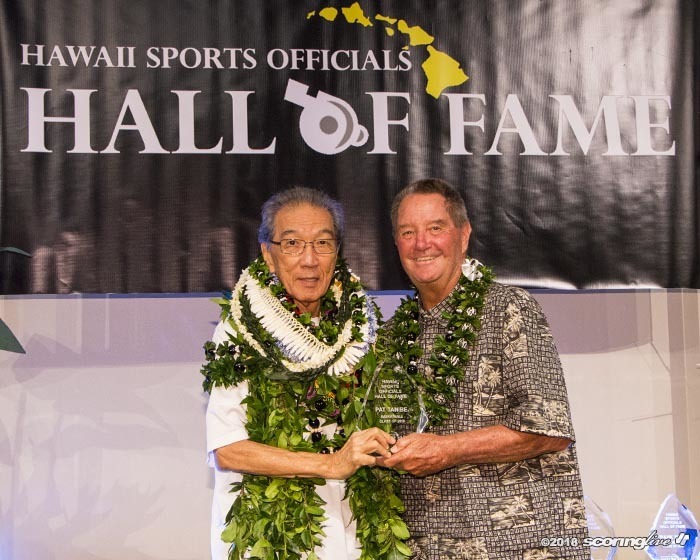 He has continued to mentor officials for the past 20 years." 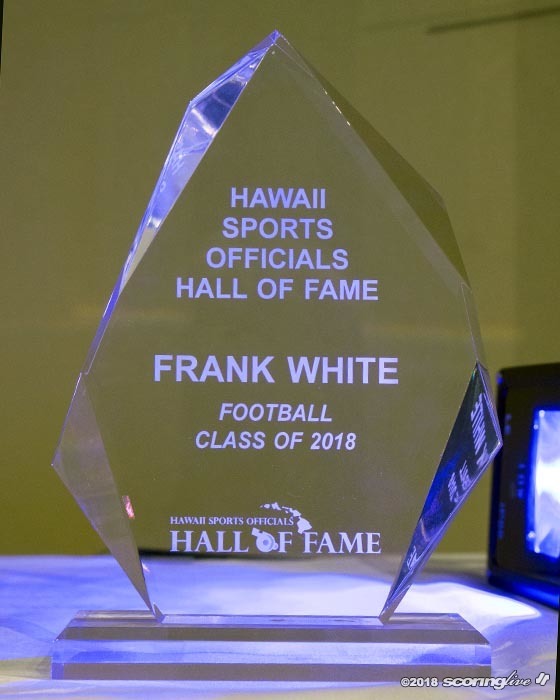 Frank White (football): One of a handful of officials to succeed on the high school, college and professional levels. 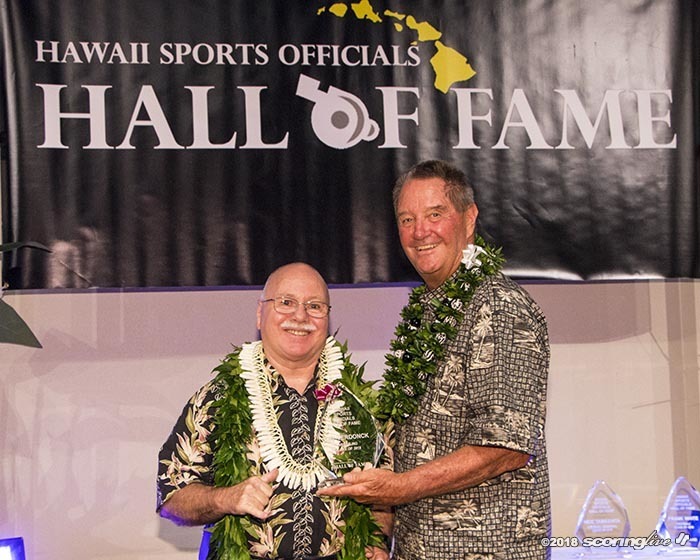 Following 15 years of high school officiating, Frank worked the next 24 years as a Division I football official in the Western Athletic Conference. 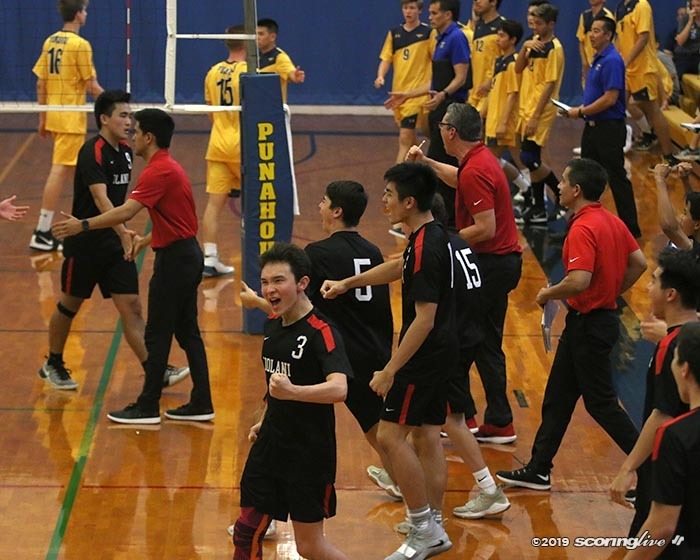 He also worked six seasons in the professional ranks in Arena2 football, culminated by being named the referee in the af2 championship game in 2004. 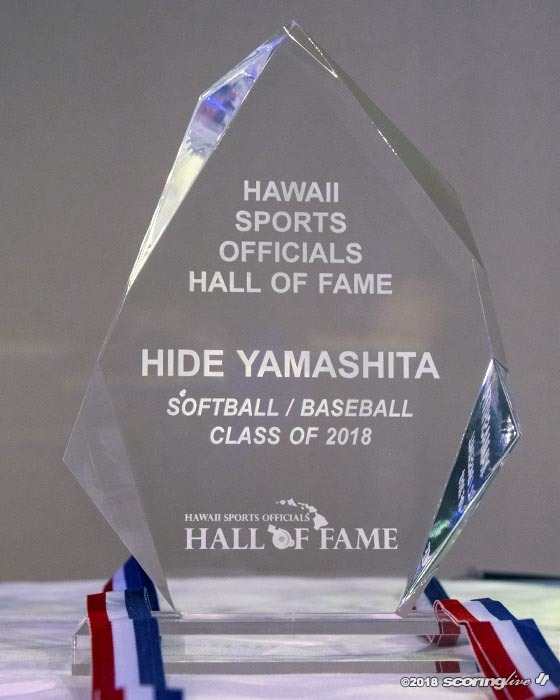 Hide Yamashita (baseball/softball): Unprecedented service as an umpire working over 75 years from youth softball in 1034 to high school and University of Hawaii baseball games. 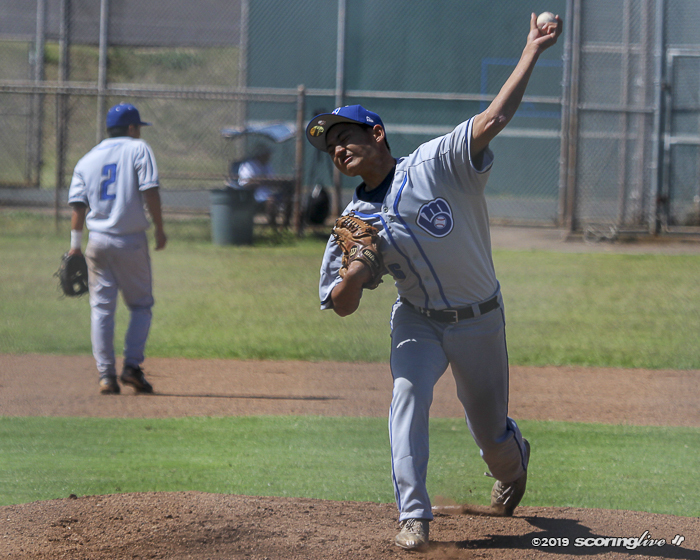 After "retiring" from college baseball in 1989, he continued to work both high school baseball and various softball leagues until 2010, when he retired at age 92. 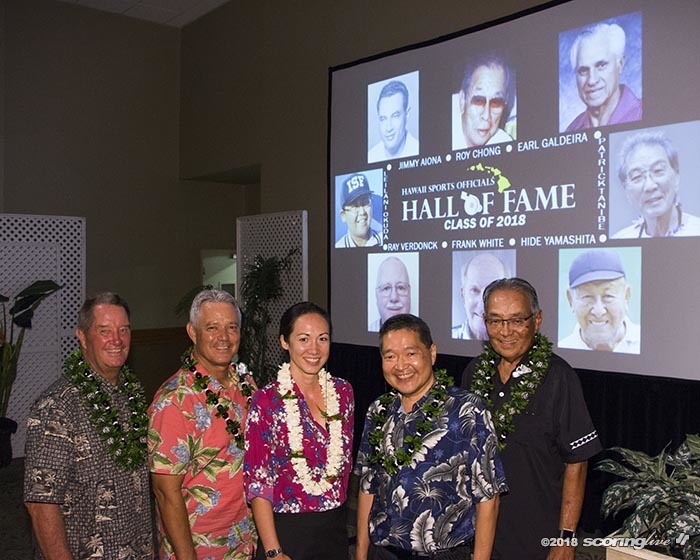 Never saying no to a baseball or softball assignment, Hide served as an umpire when Major League teams passed through Hawaii. 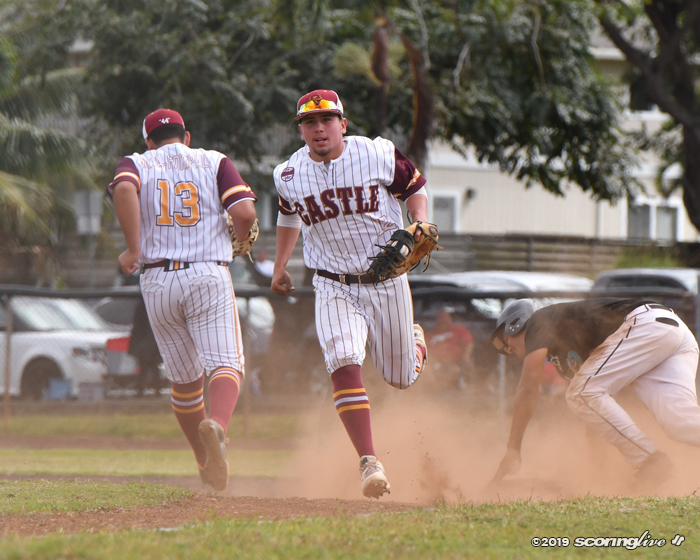 Despite his small stature, considered one of the giants in humanity and humbleness on the diamond. 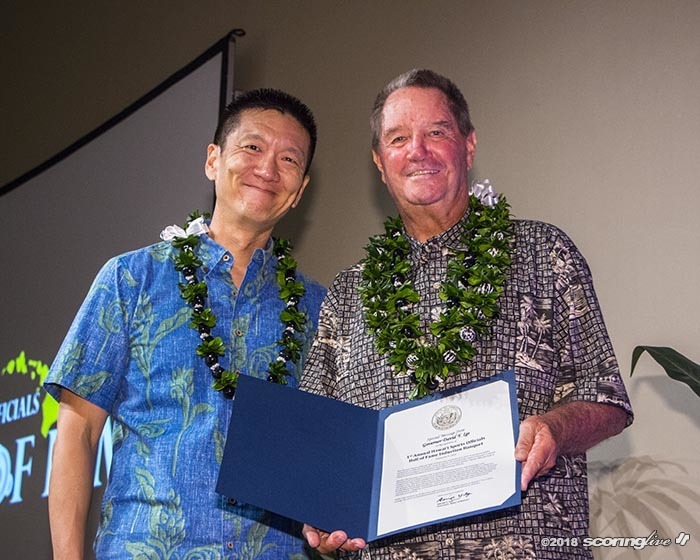 Accepting the award were Hide's sons Samuel and David. 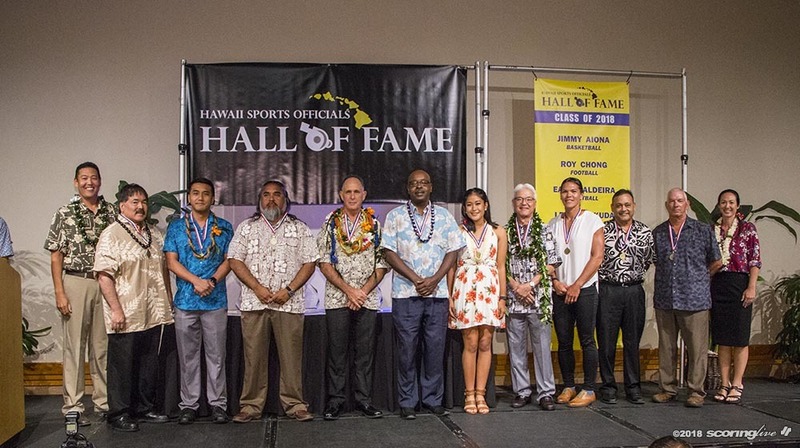 In addition, Officials of the Year awardees for each sport were also recognized and presented by the Hawaii High School Athletic Association: Jim LeBeau (baseball), Kirk Hottendorf (boys basketball), Brandy Richardson (girls basketball), Mike Goshima (football), Edward Hanashiro (judo), Aayush Dhakal (boys soccer), Janelle Bailey (girls soccer), Charles Yarrell (softball), Sandy Drake (swimming/diving), Bill Liston (tennis), Allan Fernadez (track and field), Kanamu Akana (boys volleyball), Randy Rubonal (girls volleyball), Michelle Wong (water polo) and Stan Ono (wrestling). 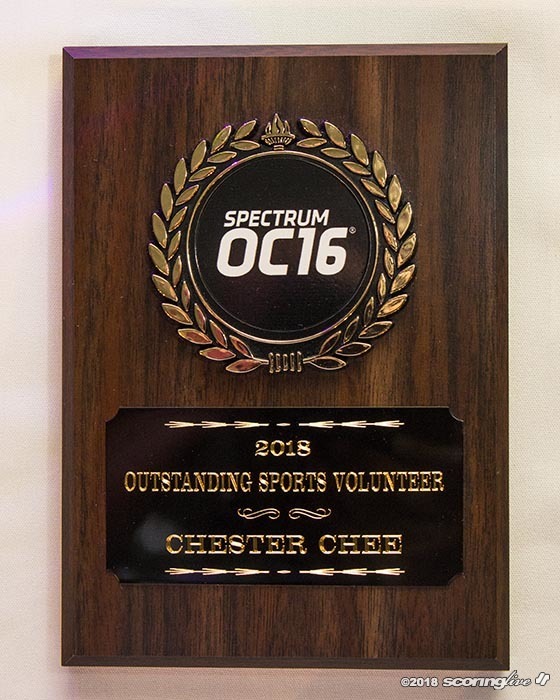 Also receiving Outstanding Sports Volunteer awards were former soccer statistician Chester Chee and former Maryknoll athletics director Pattie Heatherly. 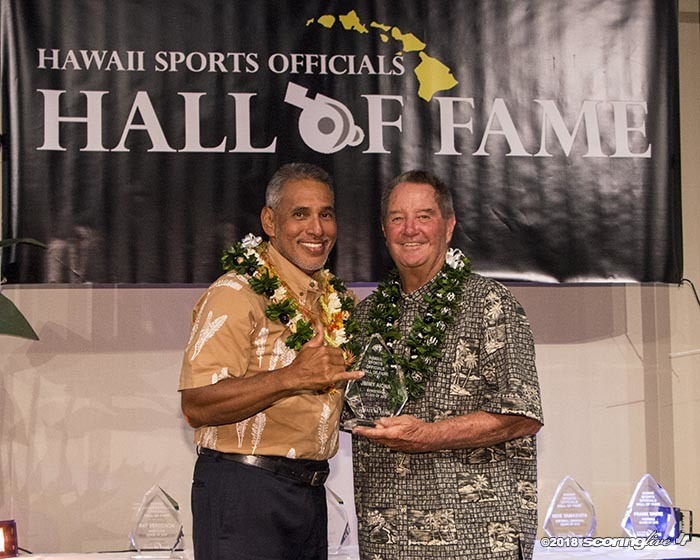 The HSOHOF was founded in 2017 to promote public awareness of officials and their value to sports. 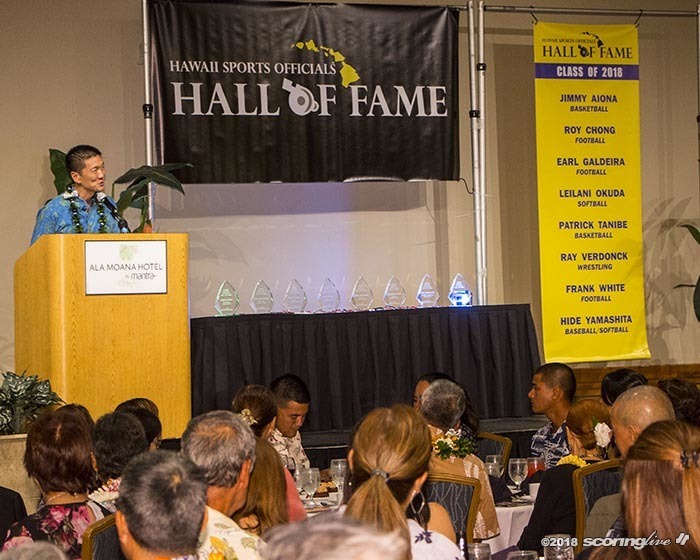 For more information about the HSOHOF, the selection process or to submit nominations for the Class of 2019, visit the website at hawaiisportsofficialshalloffame.org.